A petrol engine driven saw, mainly but also available with electric motors. Used for lopping and cutting down trees. What a brilliant invention these were. The leap of mind to actually look at the existing technology of chain and sprocket and think about incorporating cutting facets. Certain chain type cutters were seen in the 19th. century, but it was in the 1930's that a couple of US inventors gave us the tool that we have today. Blimey! What a shot, I'd sooner him than me. 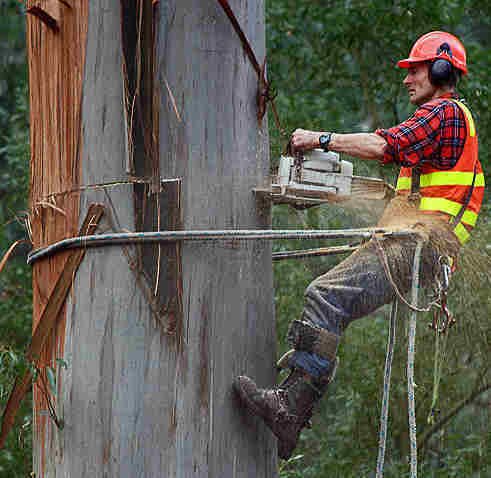 What would be the consequences of the top bit falling early and splitting the trunk past the worker's harness? For the most part these saws are driven by small two stroke petrol engines. The engine itself is a marvel of ingenuity in that most other engines have to operate in place with only a small amount of movement allowed. 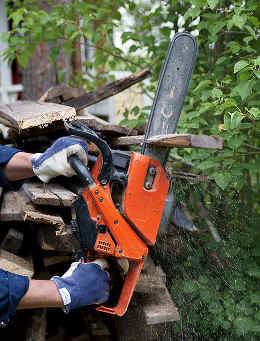 The chainsaw however can operate sideways and almost upside down, depending on the position of the material being cut. It is so good at doing what it does that dozens of other small machines use these engines. 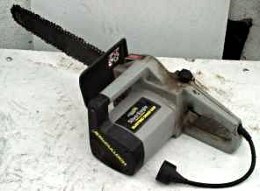 On the right is a small shot of an electric saw. At first thought one might think that they would be a bit of a waste of time but think again. I have noticed on quite a few formwork sites where the guys are using 100mm and 150mm (4" and 6") timber that the chainsaw is the preferred saw to lop these timber to length. Also I have seen them used selectively on demolition work. 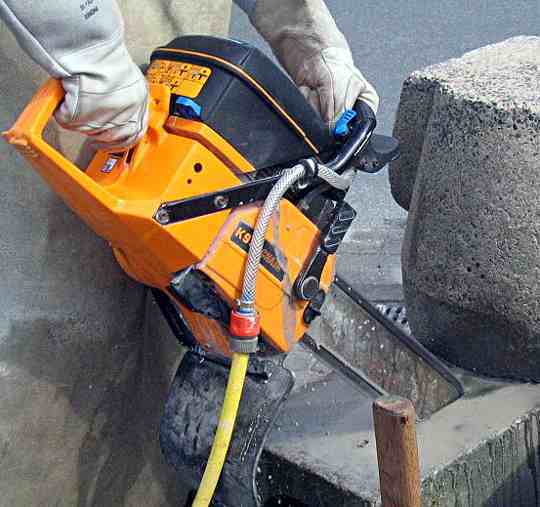 I have used these saws now and again, on hire to do specific jobs. I think that hire saws have a hard life because people tend to push them too much when they start to get dull. The average hirer does not have a clue how to sharpen a chain and so they abuse the machine when the cutters gets dull. Using a dull saw is not only damaging the machine, but for safety reasons a sharp saw is a safer saw. There are heaps of instructions on the web for sharpening chains, but really for a one off job it is very simple. Get a round chainsaw file or rat tail file from your local hardware store the right size. Wipe the chain with an oily rag to clean off the main dirt then brush into the links etc to get it as clean as you can. Set it up somewhere solid. Leave the chain on the machine and just look at the teeth to see which way they go and place the saw-file into the front of the cutter just lightly resting in the compound angle that is already there. Give say two or three strokes to each tooth. You have to do one side first and then reposition the machine to do the other side. Wipe the saw with an oily rag to remove any metal swarf (filings) and then oil it thoroughly and check that it is not too loose. This I how I do a quick touch up on a hire saw but if I owned the saw I would follow the instruction manual. The main thing is if the saw is not cutting well do not press on. Stop and sharpen it of get it sharpened. Chainsaw safety feature. Chainsaw cutting chain depth gauge. Safest operation of a chainsaw requires that the cutting chain is properly sharpened. The depth gauge is the small metal hump on each cutter link, in front of the cutter blade. The thickness of the wood chip cut is defined by the distance of the depth gauge below the leading edge of the cutting blade. This is defined by the chain manufacturer for each variety of chain, and is 0.65 mm on the chain shown above. Filing the depth gauge down below this height can make the saw difficult to control and increase risk of kickback. The chain itself is Stihl "rapid super" with 0.325 inch pitch and 1.6 mm drive link gauge. What we see here is a masonry cutting chain saw that is cutting using the wet method. The water is essential to keep the blade cool and it helps to flush the moving parts stopping the formation of what would be a blade destroying "grinding paste".